Weighed Words LLC, 9780972525466, 228pp. How can you find consolation? What sets your mind at ease? What can you hold onto when the world around you crumbles? What is solace and how do you find it? This insightful anthology features essays, poetry, and fiction on these vital questions. By the very nature of its theme, this collection delves into global problems such as our endangered planet and the effects of war and hate as well as individual struggles like the death of a loved one and the consequences of aging and illness. 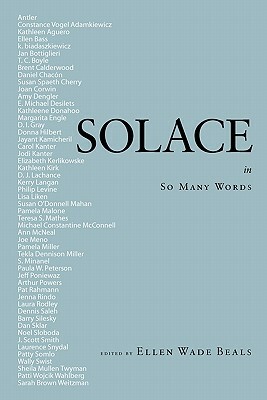 Whether read cover-to-cover or savored one contribution at a time, "Solace in So Many Words" connects with readers through the heartfelt and compelling writing of more than 50 writers, including Antler, T. C. Boyle, Philip Levine, and Joe Meno, as well as newer literary discoveries who offer well-crafted words on what solace can mean to us today. A timely and timeless book to give as a gift to comfort a friend or to keep for yourself to gain a new perspective on coping with life's difficulties. "Each entry feels fresh, as it offers another angle on finding a way to remain intact through life's complexity." Thomas Moore, "Care of the Soul" "This collection offers an engaging account . . . of what it is to be human, vulnerable, and how to keep on loving in spite of it all." Doug Holder, Ibbetson Street Press "A trip around the world of experience and reflection." Sharon Fiffer, editor of "Home: American Writers Remember Rooms of Their Own," "Family: American Writers Remember Their Own," "Body" and author of the Jane Wheel mystery series. "The diverse bedfellows who appear here prove artful words can be a balm for pain, one's own or the wider world's." Susan K. Perry, Creativity Blogger of PsychologyToday.com and author of "Writing in Flow.